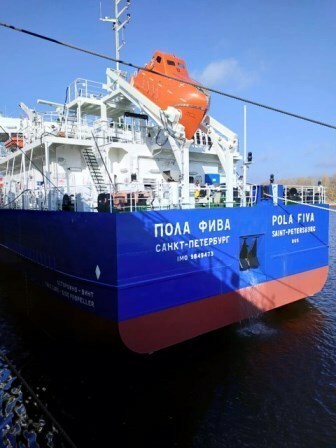 Krasnoye Sormovo shipyard (a company of United Shipbuilding Corporation) has delivered the fifth dry cargo carrier of Project RSD59, Pola Fiva, says Marine Engineering Bureau, the series designer. The ship’s sea deadweight has been increased by 414 tonnes to 8,144 tonnes. Under the contract with State Leasing Transport Company as the customer and shipping company Paula Rise as leaseholder, Krasnoye Sormovo is to build five ships of Project RSD59 with Nevsky Shipyard to deliver five more ships of this project. The contract was signed in December 2016. To date, the four RSD59 vessels - Pola Makaria, Pola Sofia, Pola Filofeya and Pola Feodosia have been delivered to the Customer and are being operated on inland waterways. RSD59 ships of Volgo-Don Max class have two cargo holds and the maximum dimensions to sail along the Volga-Don canal. The vessel is designed for transportation of general, containerized cargo, timber, grain, oversize cargo and dangerous goods of B Class in R2 navigation area with waves up to 3% and standing off a place of shelter within 100 miles (distance between shelters should not exceed 200 miles), inland waterways of Russia (with some restrictions).